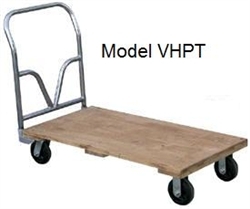 Hardwood Platform Trucks are the economical solution to your material handling needs. 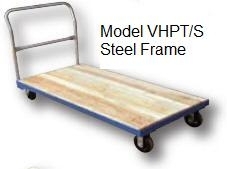 Constructed of 1" thick hardwood, these platform trucks have a maximum capacity of 1,600 lbs. Units roll smoothly on 6" x 2" mold-on-rubber casters, two rigid and two swivel. Casters and removable steel push handle are bolted on. Countersunk holes allow for a smooth deck surface.